Former Michigan House Fiscal Agency Director Mitch Bean, Michael LaFaive of the Mackinac Center for Public Policy, and MSU economics professor Charley Ballard. Bad news, Michigan: Another recession is coming, sooner or later, and the state’s next governor should take steps to prepare for it. 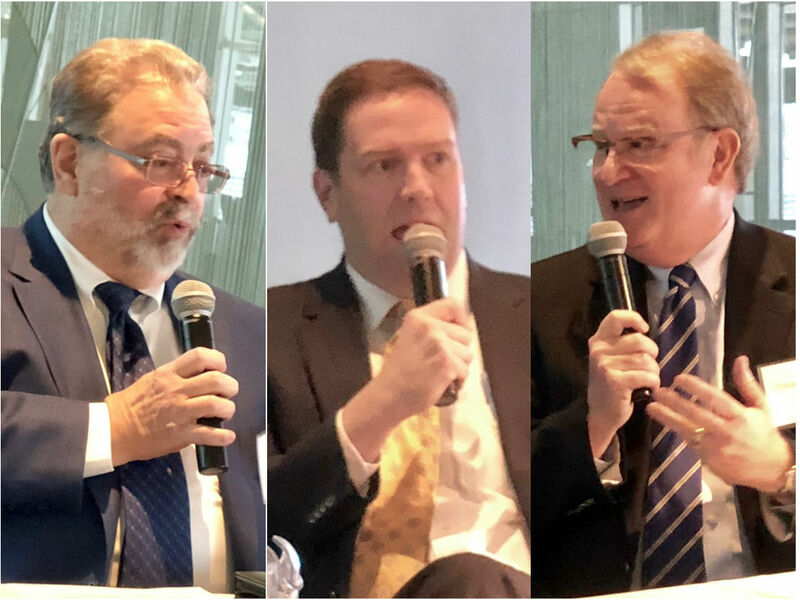 That was the conclusion Wednesday from three economists in East Lansing at the first of four Solutions Summits put on by The Center for Michigan and Bridge Magazine this month. Ballard, a Michigan State University economist; LaFaive, senior director of the Morey Fiscal Policy Initiative at the Midland-based Mackinac Center for Public Policy; and Bean, former director of the nonpartisan state House Fiscal Agency who now runs Great Lakes Economic Consulting were panelists at the East Lansing event. On Wednesday, Bridge and the Center also kicked off the 2018 Michigan Truth Tour, which will stop at communities across Michigan during this year’s election cycle to highlight critical issues that will help voters make informed choices for governor, other statewide offices, and all 148 legislative seats in the House and Senate. Nearly 200 people attended the Wednesday summit at Michigan State University, which focused on the decisions facing state lawmakers on creating thriving metropolitan regions, preserving the state’s natural resources, upgrading roads and other infrastructure, restoring trust in government, and discussion of citizen-driven ballot proposals. “We have a choice: This election can be about platitudes and fake news, or it can be about substantive issues,” said John Bebow, president and CEO of The Center for Michigan. “And the majority of people who came here today are voting with their feet. They want it to be about substantive issues. One perennial hot-button issue is taxes. Some Republican state legislators have made cutting income taxes a priority, while Michigan faces crumbling infrastructure and struggling public schools that reform advocates say require additional investment. In a question-and-answer session, Ballard, LaFaive and Bean offered ideas for state fiscal policy related to taxes, economic development and municipal governments. Ballard, of MSU, noted that while Michigan has not yet recovered all jobs it lost during the late-2000s recession, the extended economic recovery has steadily raised employment. He said many conservative lawmakers often sign pledges not to raise taxes when they’re running for office, which can make it difficult to raise revenue to address urgent needs. Ballard said he would favor an approach that would lower the state sales tax from 6 percent to 5 percent and extend it to more goods and services to raise more revenue. LaFaive, of the Mackinac Center, lauded state fiscal reforms under Gov. Rick Snyder that have led to a better corporate tax system, while criticizing Snyder’s decision last year to sign into law new tax incentives for businesses. LaFaive would eliminate the Michigan Economic Development Corp., which manages the state’s business attraction efforts, and redistribute its budget to cut taxes, invest in infrastructure or boost the state’s financial reserves. Bean, the former House Fiscal Agency director, said he is concerned that more local governments could become fiscally distressed and wind up in state receivership. Many communities continue to struggle to recover local revenue from property taxes since the Great Recession, Bean said, because state law limits how fast taxable values can grow. Bridge and The Center for Michigan will host additional Solutions Summits on education and personal prosperity next Thursday, March 22, in Detroit, and Friday, March 23, in Grand Rapids.